Your stay at Aríel's offers much more than a relaxing night's rest. 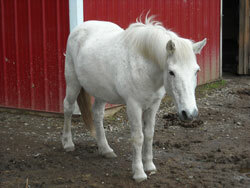 You will want to tour the property and visit Ariel the Icelandic horse and the other residents of the barnyard. Rock your stress away while sitting on the porch of Aríel's Bed & Breakfast. Watch Aríel and her friends, enjoy the view, smell the country air and plan a picnic. Stroll the grounds and find flowers and wildlife. Be sure to watch for some more of those unique and charming items decorating the porch and grounds as they do the house interior.